Sebarenzi grew up in Rwanda, and as a child saw glimpses of the tribal violence which years later would engulf his country. In 1994, when Hutu extremists slaughtered more than 800,000 Tutsis; Sebarenzi, his wife and child were safely out of the country, but many of Sebarenzi’s extended family were not so lucky. Returning to Rwanda, Sebarenzi rose through the ranks of Parliament, eventually becoming Speaker, third in power only to the country’s president. As the leader of parliament, Sebarenzi worked to improve good governance, speaking out for the independence of the legislature and against corruption in the government. Forced to resign, and informed of a plot to assassinate him, he fled Rwanda and found exile in the United States. Dr. Sebarenzi is currently a visiting professor at the School for International Training where he teaches conflict resolution and human rights; a member of the Board of Directors of Karuna Center for Peacebuilding; a regular speaker on BBC and Voice of America; and he also serves as advisor to the Human Rights and Special Prosecutions Section (HRSP) in the United States Department of Justice. He has served as an executive for national and international nonprofit organizations in Rwanda, the Democratic Republic of the Congo, and Burundi, and is an expert in the Central African region (Rwanda, the Central African Republic, the Democratic Republic of the Congo, and Burundi). Sebarenzi has spoken hundreds of times in the U.S and Canada, at colleges and universities, middle and high schools, churches, U.S. government agencies, and academic forums (including as a commencement speaker). For his college lectures, Sebarenzi tells his dramatic and historic story, and imparts a message of peace and forgiveness. This unforgettable and emotional program is perfect for International Studies departments, Genocide Programs, African Studies, Multi-Cultural Programs, Peace Groups, Christian organizations and keynote lectures. Whatever your group, Dr. Joseph Sebarenzi is a man of peace and grace whose message will not soon be forgotten. 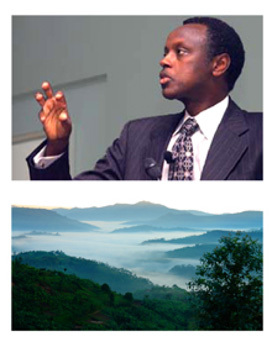 “God Sleeps in Rwanda: A Journey of Transformation” – by Dr. Joseph Sebarenzi. In the post-genocide Rwanda, Sebarenzi worked for reconciliation and forgiveness, despite all he had endured. His encounter with a former mayor of his family’s district is a testament to his remarkable sense of forgiveness and compassion; the former mayor was in prison on accusation of giving the order to slaughter the Tutsi who lived there, including Sebarenzi’s family.